It is a truth universally acknowledged that a badger in want of a home will plump, like as not, for a scheduled monument. White Barrow the National Trust’s first property acquired solely for archaeological conservation 1909. 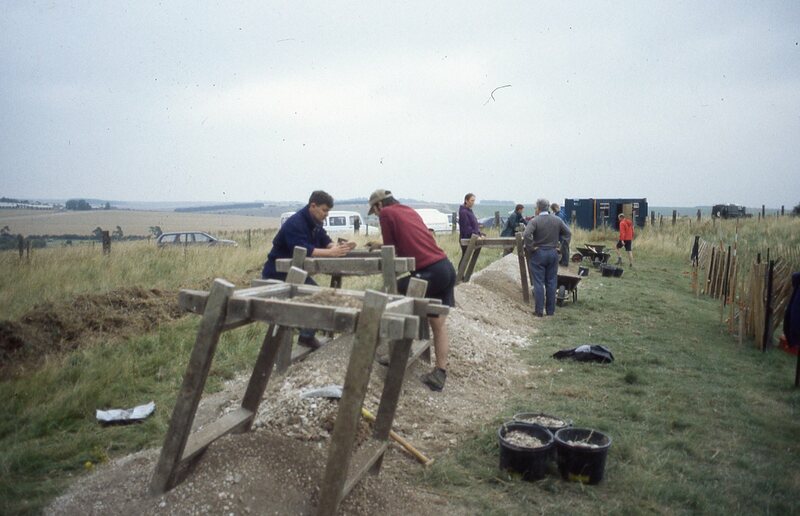 In 1909, White Barrow on Salisbury Plain was the National Trust’s first ever acquisition of land solely for its archaeology. It is a rare and well preserved Neolithic long barrow, used as a burial place about 5,000-5,500 years ago. It lies along a track outside Tilshead on the road from Devizes to Shrewton in Wiltshire. In 1909, White Barrow was in danger. 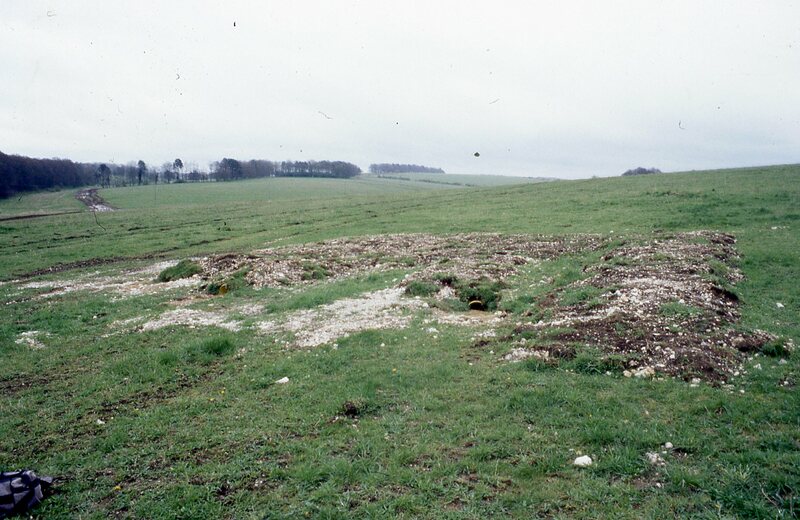 New farming demands meant that Salisbury Plain, after millennia of being used only as sheep pasture, was rapidly becoming ploughed up. 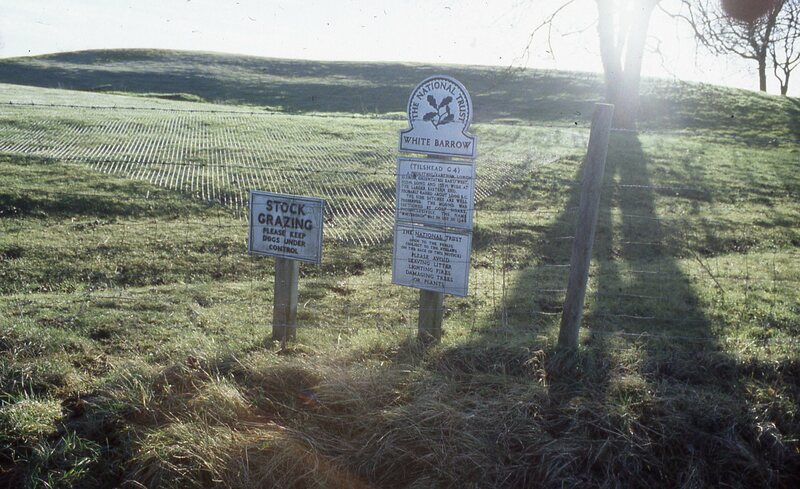 Therefore, White Barrow was bought by public subscription for £60 to prevent it being destroyed. 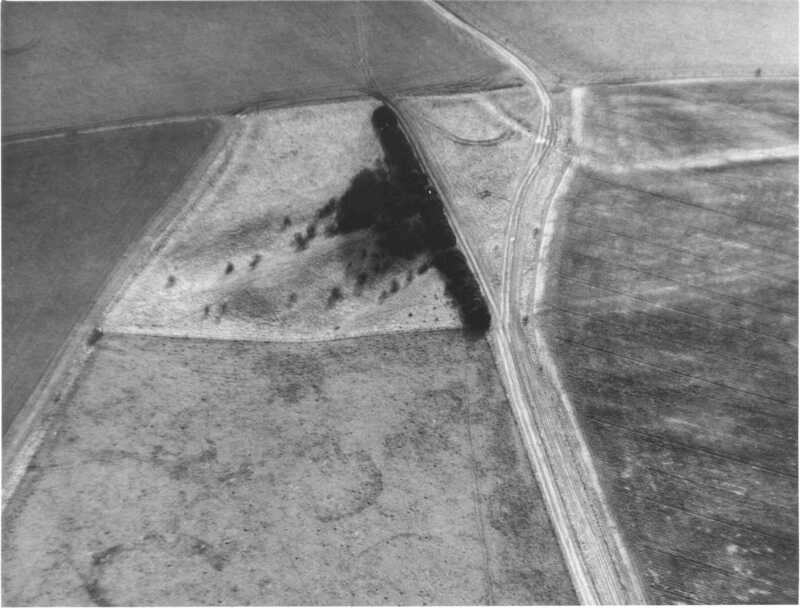 Aerial photograph of White Barrow on Salisbury Plain showing it as an island of unploughed pasture in a sea of ploughed arable land. This special place is now an isolated island of archaeology and nature conservation in a landscape that has been heavily cultivated over the last 100 years. The long barrow looms like a whale-back from the landscape 90m long and 50m wide and over 2m high. There are wide ditches on either side where the chalk was quarried over 150 generations ago to make a sacred monument to house the ancestors of the local farming community. A refuge for wildlife, of wildflowers and orchids… and so it was that a family of badgers checked the place out and saw it as a great place to raise a family. They selected the sheltered southern ditch with its soft silts which were easy to burrow into.. However, as time went on the family expanded and the sett got larger digging through the archaeological deposits. Visitors picked up flint tools and Neolithic pottery chucked out in the burrow spoil. The badgers seemed to ignore completely the legislation that states quite clearly that it is illegal to dig on a scheduled monument without government consent. Diplomatic immunity I suppose, because badgers are a protected species and White Barrow is also a site of special scientific interest for its wildlife. Something had to be done.. and so it was that Simon the ranger, Graham the rural surveyor and Martin the archaeologist met on top of White barrow and looked at the mess. The badgers had trashed an area of the ditch and lower mound over 25m long and 3m wide and they were heading for the east end where the burial chamber lay. Could we put a badger proof fence around the site? This had been tried elsewhere in the past and once the fence was breached the fence was useless. How about armour plating it …. and so it was decided. Simon and Mike laying the chain-link fencing across the long barrow mound apart from the badger sett area. However, not that simple. The badgers needed a new home and the NT land was all designated. A summit meeting with our Ministry of Defence neighbours identified a suitable area a few hundred metres away. Badger surveyors made sure it lay within our badger community’s territory and the new sett was built with chambers and burrows with Rosie our archaeologist standing by to make sure no new archaeology went unrecorded. Then English Heritage sent a crack team of geophysical surveyors to record the site before it was meshed because it would not be possible once the cover was put in place. This demonstrated that at the wider east end, the burial chamber was clearly visible and the badgers were not far off. 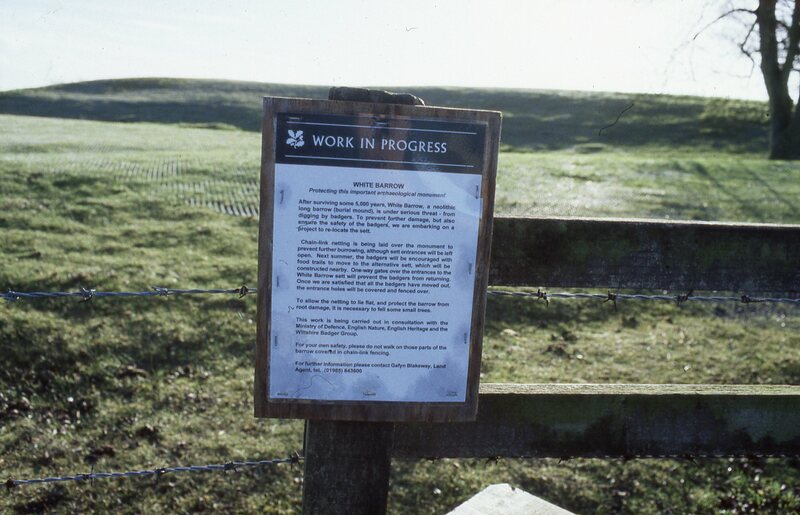 The notice explaining the badger re-homing work after the main barrow had been fenced. Simon bought the chain-link and unrolled a silver cover across the barrow.. apart from the sett area where fencing was placed around the burrows. This had a number of two-way gates place within it. Our badger adviser made sure that the work took place in late summer so that the badger families had grown up. Trails of honey-coated peanuts then led the badgers to their new home and for a few weeks both setts were available but then the gates became one-way gates and the badgers stayed in their new accommodation. 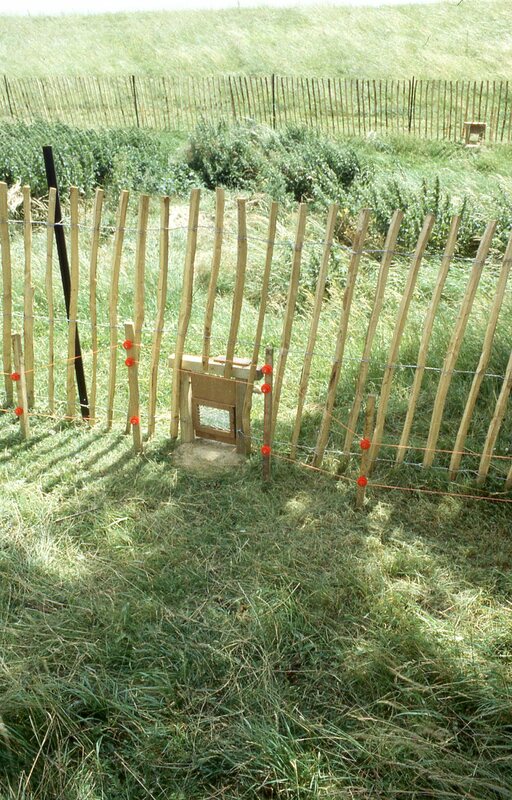 One of the two-way gates that allowed the badgers to go backwards and forwards from their new home following trails of honey-coated peanuts. Time to level the spoil from the burrows and complete the protection of the burial mound. A group of archaeology volunteers were recruited as part of a National Trust working holiday and we borrowed archaeology sieves and frames from Wessex Archaeology. This enabled the archaeological artefacts disturbed by the badgers to be collected before the spoil was spread across the barrow. Levelling the spoil from the burrows to enable to rest of the chain-link fencing to be laid. The volunteer archaeologists on a working holiday sieving the badger spoil for prehistoric flints and pottery. In the following weeks the fence was taken down, the area was covered in chain link and the grass grew. 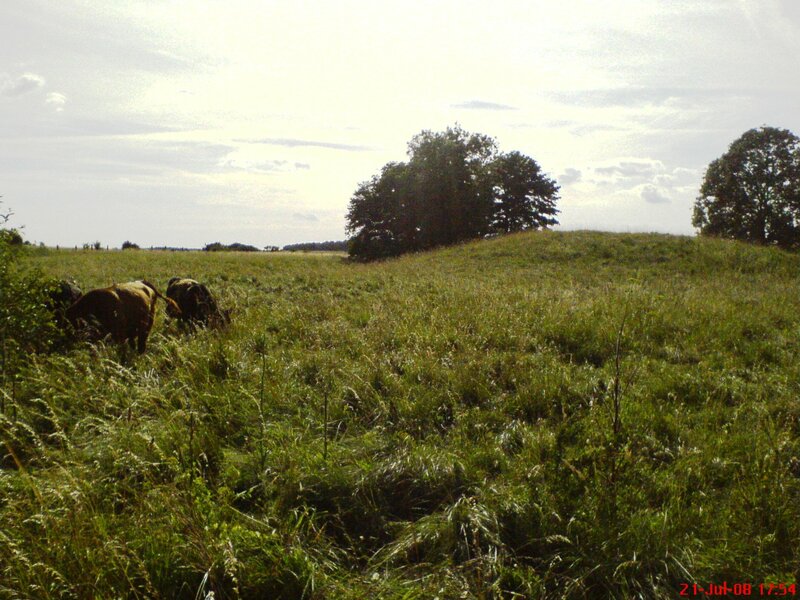 Now, 16 years later the badgers are safe in their new home and the White Barrow is grazed by cattle. The chain-link has settled into the turf but you know now that its archaeology is protected against future badger families in search of a des. res. 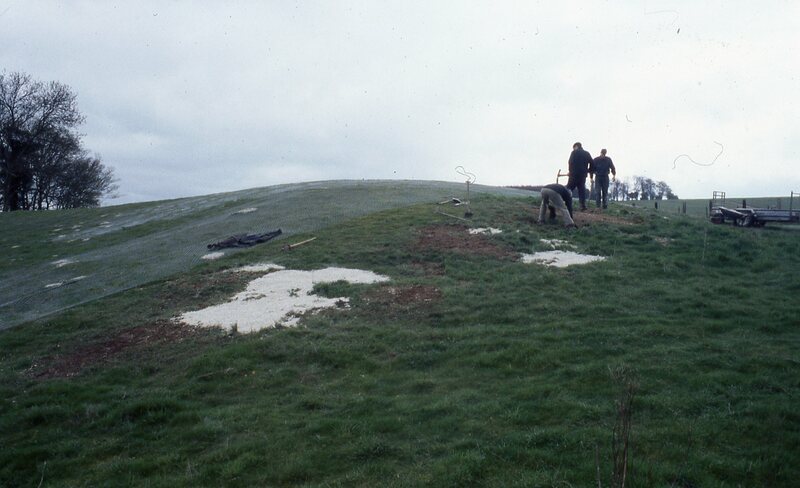 White Barrow with its protective cover hidden which has settled into the turf. The cattle graze there unknowingly and the badgers are in their new home. 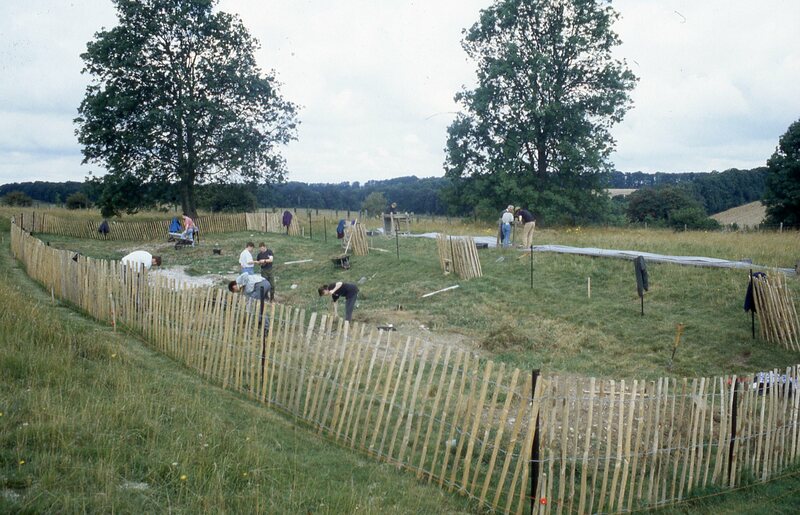 This entry was posted in Archaeology, Conservation, Finds, Geophysics, Uncategorized and tagged Geophysics, Neolithic long barrow, White Barrow by martinpapworth. Bookmark the permalink.